Welcome to 2015 (Gregorian) to all who fly the good flight in Pelicanland and beyond. With the start of the new year comes the start of the WEEKLY Hail Pelicus, so start getting those report in! 2014 was a year full of excitement, surprises and, naturally, lots of rugby. Some good, some not so good and some great rugby, but all of it was rugby and that can’t be a bad thing, can it? We here at the staff of Hail Pelicus have fond memories of 2014 but are eagerly looking forward to 2015. Vegas 7s! SuperSites! The Return of the Pelicans! The World Cup! There is much to look forward to and I for one can’t wait. Beatus Novus Annus! I am sure that we have all by now completed our holiday fitness regimen and are ready physically for the upcoming season, but that is only part of the preparation needed. This may come as a shock to many coaches and players, but we as referees need to be mentally sharp as well and that means constant brush ups on law. Our Noble Leader Pelicus Iudex Pennipes has designed a series of law exams based on the exams used by New Zealand Rugby. All referees interested in receiving additional training are encouraged to attend as well as anyone interested in what the referees are thinking when we make that critical call against your side. Remember, these are the meetings where the referees all get together and decide who is going to win the next month’s games, probably by calling a critical pass interference and then picking up the flag because this isn’t football. If you would like to nominate a name for yourself you can send a request to Paul Bretz (Pelicus Iudex Pennipes) at chairman@pelicanrefs.com and I am sure he will do something with it. NOTE: You may not get the name you request. Some names are earned and/or bestowed without your consent and can’t be fought. Referees need to be CIPP’d too! Don’t forget to get registered with USA rugby. Once you’ve registered send your society dues, $10.00, to Jim Crenshaw. The NCRFU will continue to use the assignr system for assignments and match reports. Please make sure that your availability is correctly listed on the site – if you aren’t listed as available you probably won’t get assigned. Under “My Availability” you can make yourself available for a block of dates and then recuse yourself for specific dates if needed. Please remember when filling out your match reports on assignr, ASSIGNR IS NOT WHERE YOU REPORT MISCONDUCT. The report section of assignr is for the match summaries that are below. If there are red cards or reportable yellow cards in your match then report them via the channels described on pelicanrefs.com. The Northern California Youth Rugby Association, with the assistance of the Northern California Rugby Referee Society, will host a Level 1 Officiating course Sunday, January 11, 2015, in Orinda, CA. Time: The course will start at 8.00am and end at 5.00pm. Location: Either at Wilder Field or Campolindo High School, both in the City of Orinda, CA. The exact location will be confirmed after the first of the year when school officials return and all registrants will be notified of that location. Online registration at USA Rugby and with the NCYRA will remain open through Wednesday, January 7th after which any further registration may only be accomplished by personally contacting the lead Trainer, Mike Malone (mgmalone@comcast.net), no later than Friday, January 9th. The last few years, Pelicans have been needed at the Hawaii International Sevens, held on Oahu the second weekend (Friday-Saturday) of December. It’s pay-your-own-way, not an exchange, but we’ve always managed to find a few folks who would spring for such an excursion. This year Cary Bertolone, James Hinkin and JC van Staden joined me for the event, with JC and me bringing our wives. Everyone having made their own arrangements, we were at four different hotels in Waikiki. The slow season for tourism in the islands, such as it is, runs October – mid-December. The weather hardly varies year-round – i.e., highs of eighty and lows of seventy – but the length of daylight swings about two-and-a-half hours (compare to more than five at the latitude of San Francisco), so there isn’t as much time to get an unseasonable sunburn. James joined Penelope and me for one of our traditions, dawn atop Diamond Head on the first morning there. It’s an easy uphill hike of about a mile with million-dollar views. Another tradition is dinner at the Shorebird, where you graze at a wonderful salad bar and then cook your own entree – steak, kebabs, fish. The van Stadens had a prior engagement, dinner at a restaurant that included Peltier Station on its winelist, but JC dropped by to present us with a bottle of eponymous wine, his own private label. Three years ago, we met with the governor. Two years ago, we met with the mayor. This year we met with a drunk who wanted to pick a fight during the captains and officials meeting the night before the event. We thought, surely he knows he’s outnumbered? 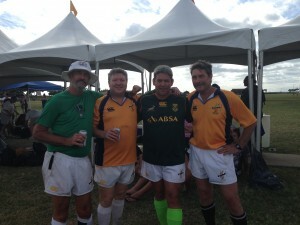 There were a dozen of us – not ‘me’ us, you understand, but ‘rugby-player’ us. It only occurred later: probably eveyone else in the place, all looking like regulars, might have bailed him out. Good times! During World War II, Britain went on double-daylight time. Well, this tournament features doubly-altered time as well: the well-known Rugby time combined with Island time. It makes getting to the pitch on time a snap: you can arrive late and still be more than an hour early. Ever been to the Mystery Spot near Santa Cruz? It’s disorienting. Same thing occurs when you visit the pitch that was laid on for the tourney. How to describe: technically, it was a rhombus with internal angles of 72 and 108 degrees, 100 by seventy meters. The goal lines, as laid down, were seventy meters apart, but the night crew that put up the goalposts put one on the goal line and the other on the deadball line. Now the field-of-play was eighty meters long, with the ‘mid-field’ line 35m from one goal and 45m from the other. You can do the trigonometry. With the corners being 18 degrees away from right angles, the goal posts (properly centered, I might add) were offset from each other by 25 meters. Back to the Mystery Spot: the same person can be both shorter and taller than another person, depending on where they stand. Well, on this pitch, you can have a scrum at the center of the halfway line and still have a short side, a wide side, a deep end and a shallow end. In the four years the tournament has been held, its international character has consisted of a single team: Deadwood RFC, from Australia. You can find them on the web – they play to raise money for charities, mostly children’s hospitals. They finished second in 2013 and won the event the other three times. This year there was a women’s bracket as well, which was won by Youngbloodz of Minnesota. A young local ref was recommended to us as the best ref in the state. He did a fine job but only too late did we realize that he never bothered to keep score. The last game of the round-robin turned out to decide who would advance to the final. The announcer-scorekeeper had it as a draw. Both teams felt they had made a conversion that was not credited. The ref couldn’t help. The in-goal judges weren’t much help either, and I was one of them – as we’d been involved in several dozen games on the trot and you know how all those tries and conversions can run together in the mind. We went with the scorekeeper’s tally, and Deadwood went through on aggregate points. It is a pleasure to referee in Hawaii. They have many skilled players and lots of teams, they appreciate competent refereeing, and they respect the ref and play accordingly. We had a total of one punch in 38 games. Someone observed that that’s the inverse of the ratio often encountered over there. Your scribe is rapidly transitioning to the sideline. My wife and I intend to continue to attend this event as an excuse to get to Hawaii every year, and I’d be happy to assign you a few games should you be able to join us in 2015 or beyond. Four refs is about right. It’s a selection process with two criteria: you gotta love Sevens, and you can be in Honolulu December 11-12, 2015. Do what we did and make it a week – it’s not like there’s nothing else to do. The Honolulu Marathon is the next morning and so there’s that. You could probably think of other diversions, over a few mai-tais, as well. 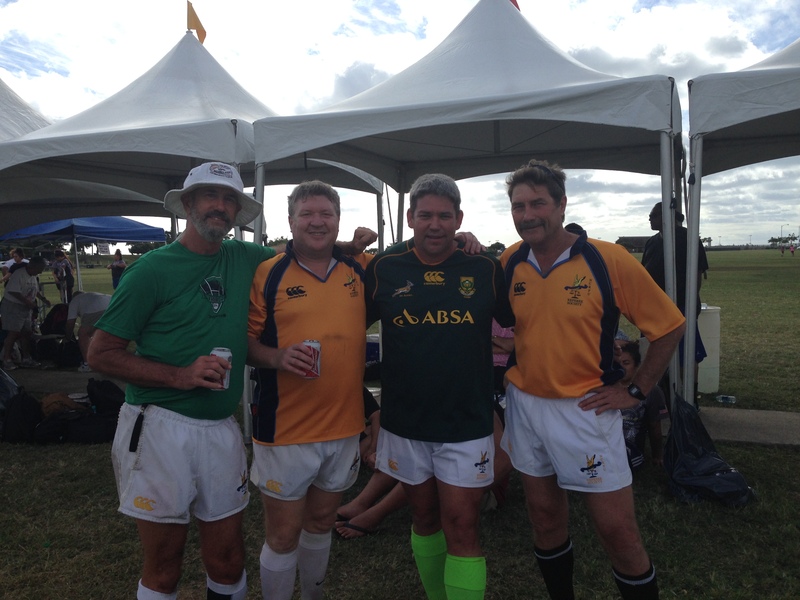 I had the opportunity to fly to Oahu with Bruce Carter, James Hinkin and JC Van Stadin to ref a 7 ‘s tourney on Dec. 12 and 13th, last week. Making a week vacation out of it enhanced the fun. Missing the bulk of the rain storms made me feel slightly guilty (only slightly, though). I reffed teams like the Maui Warriors, the Seasiders, the Raiders, PolyBlue, the Titans and the marines called Scarface. I also had a women’s game and ran touch for several games, giving me a lot of exercise. The weather was great, the players were good natured and I had a blast with my fellow refs. Bruce thought that after an enormous amount games, having zero fights was a compliment to us. It was also great to watch other refs of their high caliber! The highlight of my trip was watching the sun go down, poolside, with Bruce and James and talking about past rugby experiences, and then working our way back to our hotels with James! Too much fun. I arrived at CSUMB at 12:30 to discover that a few players from Fresno State would be late in arriving, delaying the game until 2pm. I had time to catch up on Marc Ferguson’s story about the rugby pitch on campus, and the advent of rugby in the last four years following its demise more than ten years ago. He has plenty out for the sport, and a number of foreign players with great skills. Fresno State and Monterey Bay played pretty evenly during most of the first half, but the home team had more size and power overall. They scored two tries, one converted, in that first stanza. Their flyhalf, Matai Leuta, was a dominant player on the pitch. He has size, speed, and skills to his advantage, and can cut through a defense like butter through a knife, and know when and how to kick ahead. Fresno scored early in the second half and converted, making the score, but Monterey Bay scored two tries, one on a long run by Leuta, which was converted by his drop kick in front of the posts. Fresno scored late, and I’d have to take some credit for that, as I let play go on from a kick taken by a Monterey Bay player deep in his own half near the touch line, and he had several players offside ahead, and didn’t run up field to put his team mates onside . Fresno State managed to move the ball into the center of the field, and after a breakdown and winning ruck ball, scored a try from passing the ball further across the field on the opposite. I’m impressed by the pitch at CSUMB. It rivals that of UCSC some twenty-five miles further note. Great views of the Gabilan range to the east of nearby Salinas, and at least outside the pitch’s fence, a great view to the west and south of the Pacific Ocean and Monterey Peninsula. lopsided game. three 30 min halves. Relatively good match, high level of aggressive play mostly featuring great initiative but lacking viable execution. If one did not know beforehand, one would not think this was a friendly alumni/club match. The kids won, but the alum played them tough. A lot of rock ’em sock ’em hard hitting play the entire 80 minutes. And while certainly not at mid season form, the quality was good. A really nifty standoff- center- wing and bob- is -your -uncle try was memorable. Post match beer and burgers and camaraderie in a verdant City grove while the sun goes down; why we who serve do so. Cal Maritime were more organized than a game USF side and that led to a couple of well worked Maul tries. USF had some breaks but lacked a finishing touch. Good game. Played in good spirits. Santa Clara despite ‘rebuilding’ seem to have a pretty good talent pool to develop and build on. It was a beautiful night at Stanford. No wind with an overcast sky and humid. Both teams put forth strong sides with an eagerness to win the match. The first half Stanford dominated at the ruck and used the penalties in front of goal to put points on the board with well struck kicking. It wasn’t until later in the first half that we saw Stanford put the ball over the try line. At the whistle to end the first half the score was Stanford-13 with 1 try, 1 conversion 2 penalty conversions to Cal Maritime- 0. The second half saw Cal Maritime compete more at the ruck and with good gate entry they figured out how to gain possession and with some good forward movement inside the 22 got the ball over to begin a second half scoring trend. The captains were both very good about keeping their teams discipline level on high and the lads just really played some good rugby. At 54min Stanford (#12) received a yellow card for repeated high/dangerous tackle which I attributed to players missing tackles and getting a bit lazy and the yellow saw the end of that. There was also a yellow issued to Cal Maritime at the 79th min for a late hit (#7) which was once again attributed to players missing tackles and frustration setting in. All in all I want to commend both teams for a very hard fought match. The players put their all onto the pitch last night and the final score shows just that. Cal Maritime pushed over the line twice for tries with one conversion in the second half nearly unanswered and going into the final minutes of the match the score was and would end at Stanford-16 to Cal Maritime-12. Good rugby and good hospitality by the Chico forks. The worst fields I’ve been on in a long time. There were so many ruts, holes, and mounds it was as if it had undergone a week of bombardment from enemy artillery. At least it didn’t rain. We kicked off at noon in a slight mist, but no real rain. Davis pushed one across at the eight minute mark and then both teams played close to even for a while. Davis got two more tries and were up 19 to 0 at the half. Solano scored a well earned try at the 7 minute mark and they played even for another 20 minutes. Both teams scored at the 30 minute mark for a 24-12 score and at the last minute, Davis pushed another over with hard forward work. Great sportsmanship throughout and the sidelines were fun and enthusiastic as well. The high lights were watching each team’s 8 man run and make tackles with some great tackling/collisions that even made me wince. Paul was Davis’s eight man and Solano’s was, I think, Cameron. Big guys that run and tackle powerfully! A brutal rivalry match between the two San Francisco colleges. It was a physical match from whistle to whistle. Both teams are very evenly matched. The first score of the match came with 3 minutes left in the first half scored by SFSU in the right corner. In the second half the tempo and physicality did not drop. 15 minutes into the 2nd half USF answered with a penalty kick making the score USF 3 – SFSU 5. The score remained that way until 5 minutes left in the match when SFSU scored the last points of an exhausting game. USF 3 – SFSU 12. Beautiful day after several days of heavy storms with a soggy pitch that didn’t slow down the Slugs, who are of course known to come out after the rain. Beginners on both teams – always a pleasure to referee, taking on a slightly different role – but more on the home team and it showed in the tackling and the scoreline. Best of luck to both teams. As always, a pleasure to take the pitch with young ruggers. On a brisk Saturday morning in SF, Marin and Baracus played a preseason game to get a feel for their upcoming season. Both teams looked rusty with low communication and plenty of missed tackles. Baracus was better on the day by finishing their line breaks and being able to put phases together close to the goal line. Both teams had good athletes and will be physical in the regular season. Well played friendly, no incidents ! A change in time and a change in opponents left this referee more flustered than the teams as the game was unexpectedly moved up 2 1/2 hours from the original kick off time to 10:30 – a change I was enlightened of at 10:00 while sipping my morning coffee while relaxing in my bathrobe. Adversity is my calling card, however, and as I said to the captains, “I didn’t have time to shower this morning so you’re lucky that I roll out of bed this good looking”. Stunned silence from the crowd. This preseason match was to be played in a series of 20 minute periods and the first was underway overseen by a referee’s worst nightmare – a well-meaning coach who has decided to “not call too many penalties and let them play”. The good news was that both teams were eager to learn and were not interested in extracurriculars. Once I warmed up and took over the tone of the match was set as I called approximately 6 penalties in 5 minutes. At that point the players realized that we were here to play proper rugby and cheating would be frowned upon and the game well and truly started. Silicon Valley is an established high school and youth program that has decided they have enough alumni to put together a 3rd division team. San Jose St is a talented college side who just released their previous coach and is changing directions as a club. The game itself went much to form as the largely inexperienced Spartans (many of the upper classmen were held out of this game) went into contact with great enthusiasm and poor body position that allowed the visitors to dominate much of the contact areas. Many lessons were learned on the futility of tackling high. Silicon Valley has the expected mix of wily old veterans and highly impressionable youth that one would expect on a fledgling 3rd division team and played to exactly those types. Their veterans were dominant at times while giving up some speed and athleticism to the hosts. Their youngsters were overwhelmed at times while adding energy and excitement to the match. No score was kept officially so let’s just say the final was many to lots. Two pretty balanced good games. The first one was between Sacramento and Reno. Sacramento won by 4 points. The second one was between Davis and Reno. Reno did pretty well in the first half, but certainly got tired in the second half from player two games in a row, and lost 50-13. I was nicely surprised by the level of play during this tournament. Those 3 teams have some excellent players. Players were keen to enjoy a dry day. Players were looking to play themselves into shape and seemed to enjoy the day. Everyone enjoyed their first hit out. In a preseason rematch of the D1 NorCal final last year, Sac Lions and Santa Rosa squared off for a preseason runaround. Both teams looked very different dominated by younger players and more physical play. Overall SR dominated in set piece as Sac Lions were more dynamic in the loose. 6 20-minute matches b/c of time constraints on the use of the pitch (Franklin Square Park). I did three matches and Bryant Brynes did the others. EDITOR’S NOTE: Your thoughts on what constitutes a tie have been taken on board and soundly rejected. We will expect suitable beverages at the next meeting. This entry was posted in News on January 7, 2015 by James Hinkin.